Hinton is a town in west-central Alberta, Canada. It is located in Yellowhead County, 81 kilometres (50 mi) northeast of Jasper and about 284 kilometres (176 mi) west of Alberta's capital city, Edmonton, at the intersection of Yellowhead and Bighorn Highway, in the Athabasca River valley. Hinton lies in the Alberta Plateau Benchlands physiographic subdivision of the Interior Plains. Soils around town are influenced by deposits of carbonate-rich, wind-blown sand and silt which usually have surface textures of loam, sandy loam or silt loam. They are moderately alkaline, in contrast to the varying, mostly moderate acidity which prevails beyond the zone of calcareous aeolian material. The Town of Hinton was named for William P. Hinton, Vice President and General Manager of the Grand Trunk Pacific Railway. The community was named in 1911 and remained a hamlet for the next 45 years. Settlement in the area was scattered along a line some twelve kilometres (7.5 mi) in length. A site along Hardisty Creek, is where an aboriginal group from the Jasper area had left members stricken with smallpox while the rest of the group travelled to Lac Ste. Anne to find medical aid for the smallpox epidemic which was ravaging the indigenous population in Alberta. The area was thus dubbed Cache Picote (Smallpox Camp) in 1870. In 1888, Jack Gregg established a trading post at Prairie Creek to serve travellers along the Jasper trail. The creek is now known as Muskuta Creek after an incorrect interpretation of the Cree name by white settlers. The construction of the Grand Trunk Pacific Railway saw the establishment of a construction camp at the mouth of Prairie Creek (at the Athabasca River) in 1908. A trestle was built over the creek and is still in use by CN today. In 1911 the Grand Trunk Pacific built a station house at mile 978 west of Winnipeg. The station was named Hinton, and the community was born. The Canadian Northern Railway also established a station called Bliss in 1914. The Canadian Northern Railway ran north of the Grand Trunk Pacific line and the Bliss station was located about 4 miles east of Hinton in the Athabasca River valley. In 1916 when the Grand Trunk Pacific rail line was temporarily closed, Dalehurst became the postal station for Hinton. Entrance (formerly Dyke), another important centre to Hinton, served as its communications centre. The original community known as Entrance was so named due to its location at the entrance to Jasper National Park and was located on the Canadian Northern rail line north of the Athabasca River from where Entrance (formerly Dyke) is located. The original site of Entrance is now known as Old Entrance. The Canadian National Railway became the owner of both rail lines, the Canadian Northern and the Grand Trunk pacific and various portions of both lines were used by the new parent company. The company, however, abandoned the use of the rail line through Bliss in 1926 and once again the rail line through Hinton was opened. The population of Hinton experienced a boom during the 1930s when American entrepreneur Frank Seabolt and two partners opened the Hinton coal mine in 1931. Shortly thereafter, a recession caused the population to dwindle to fewer than 100 people, but the town began to rebound in 1955 with the construction of a pulp mill. The mill brought rapid growth to Hinton and a new village was developed and was named the Village of Drinnan in 1956. The two communities amalgamated on April 1, 1957, to form the present Town of Hinton. In 1986, 23 people were killed in the Hinton train collision. In the 2016 Census of Population conducted by Statistics Canada, the Town of Hinton recorded a population of 9,882 living in 3,930 of its 4,343 total private dwellings, a 2.5% change from its 2011 population of 9,640. With a land area of 33.52 km2 (12.94 sq mi), it had a population density of 294.809294.8/km2 (763.552763.6/sq mi) in 2016. In the 2011 Census, the Town of Hinton had a population of 9,640 living in 3,781 of its 4,143 total dwellings, a -1% change from its 2006 population of 9,738. With a land area of 33.77 km2 (13.04 sq mi), it had a population density of 285.460285.5/km2 (739.339739.3/sq mi) in 2011. The population of the Town of Hinton according to its 2009 municipal census is 9,825. The census originally counted 9,812 people within the town limits but an additional 13 were added when a long-standing annexation application was approved shortly after the census was conducted. Hinton is also home to the Wild Mountain Music Fest, a weekend long show hosted by the Entrance Ranch. Hinton is one of two staging areas for expeditions in the Willmore Wilderness Park, the other being Grande Cache. Nature lovers are drawn to Hinton to visit the Beaver Boardwalk, a 3 kilometer walk where they can see beavers and other wildlife. Hinton Transit is the municipal public transportation service, operated under contract by First Canada, which is responsible for providing the vehicles, drivers and maintenance. The bus service operates on Monday to Friday from 7:00am to 8:00pm and on Saturday from 8:00am to 7:00pm. No service is provided on Sunday or statutory holidays. As a flag stop Via Rail's The Canadian calls at the Hinton CN railway station three times per week, in each direction. Emergency and other medical care is provided at the Hinton Healthcare Centre. Two weekly newspapers are produced in Hinton; the Hinton Parklander, owned by Sunmedia, and the Hinton Voice, a weekly independent newspaper that started up in June 2009. ^ "Location and History Profile: Town of Hinton" (PDF). 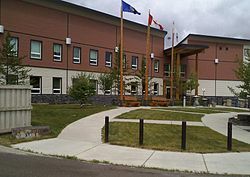 Alberta Municipal Affairs. June 17, 2016. p. 330. Retrieved June 19, 2016. ^ a b Province of Alberta (1957-03-27). "Order in Council (O.C.) 494-57, New Town Established (Amalgamation of Hinton and Drinnan)" (PDF). Retrieved April 23, 2010. ^ "Hinton Train Collision". Town of Hinton. Retrieved 2011-01-29. ^ "Hinton's Population is Up!" (PDF). Town of Hinton. 2009-07-25. Retrieved 2009-08-26. ^ "About GPRC Regional Learning Centres | Grande Prairie Regional College (GPRC)". www.gprc.ab.ca. Retrieved 2016-06-13.